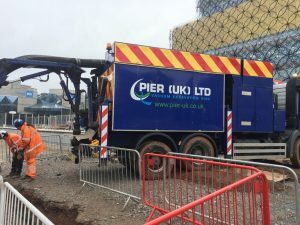 Vacuum Excavation has been the method of choice for a number of ongoing projects that are currently taking place in Birmingham. The work is taking place as part of a 10 million re-development in Birmingham City Centre and is due to be completed next summer. On this occasion the client, a Birmingham based Civil Engineering Company, required a vacuum excavator to uncover a cable that needed to be re-routed. Vacuum Excavation is often the best solution for excavation work in built up areas due to its safety and efficiency benefits. A built up city centre area can be heavily congested with pipes, cables and unknown buried services that may pose a serious safety risk to workers if struck. The high-precision remote control arm fitted on all vac ex’s eliminates the need for digging in high-risk areas which drastically reduces the risk of worker injury or costly strikes from damaged services. Busy sites with lots of contractors working simultaneously are sometimes subject to strict time constraints, requiring each element to be completed as quickly as possible. A standard vac ex can remove up to 2m3 of spoil per hour and can store up to 10m3 before needing to be emptied, making it far more efficient than more traditional excavation methods. Excavation work has historically been messy work which, when taking place in built up areas such as city centres, carries with it the risk of complaints from local residents. The vac ex’s inbuilt skip is able to store spoil from site ready to be put back when work is complete, meaning there is far less risk of mess and dirt spreading to the surrounding area. Sites in built up areas can often become busy and crowded, particularly with multiple projects and contractors competing for space, a vacuum excavator only requires two men. One to operate and one to oversee, making it a far more efficient option than hiring a team of men with a digger. For more information about Vacuum, Excavation and the service we offer, please contact us here.